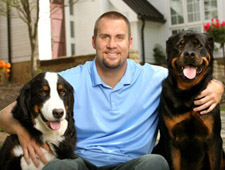 Ben announced the fourth grant of the 2011 season from The Ben Roethlisberger Foundation at The Giving Back Fund today. The foundation will be distributing a grant to the Avondale Police Department, in Avondale, AZ, just outside of Phoenix where the Steelers will play the Cardinals on Sunday, October 23rd. “The Avondale Police Department is proud to receive the Ben Roethlisberger Foundation Grant”, said Avondale Police Chief Kevin Kotsur. “It was not without our partnership with the Boys and Girls club of Metropolitan Phoenix and the Tri-City West/Thornwood Branch whose sponsorship made this grant possible. The Ben Roethlisberger Foundation is distributing grants to police and fire departments in Pittsburgh and in the cities and surrounding communities of each regular season away game for the Steelers in the 2011 season. Last summer, Ben invited police and fire departments in the local areas of those nine cities to submit proposals detailing their needs. Check out Ben’s Foundation page here and the Giving Back Fund’s website here. “Ben Roethlisberger (61.1 percent), Donovan McNabb (54.3), Jay Cutler (50.9) and Cam Newton (50.0) are the only players completing at least half their passes under duress.” — Mike Sando, NFL Nation blog at ESPN.com.